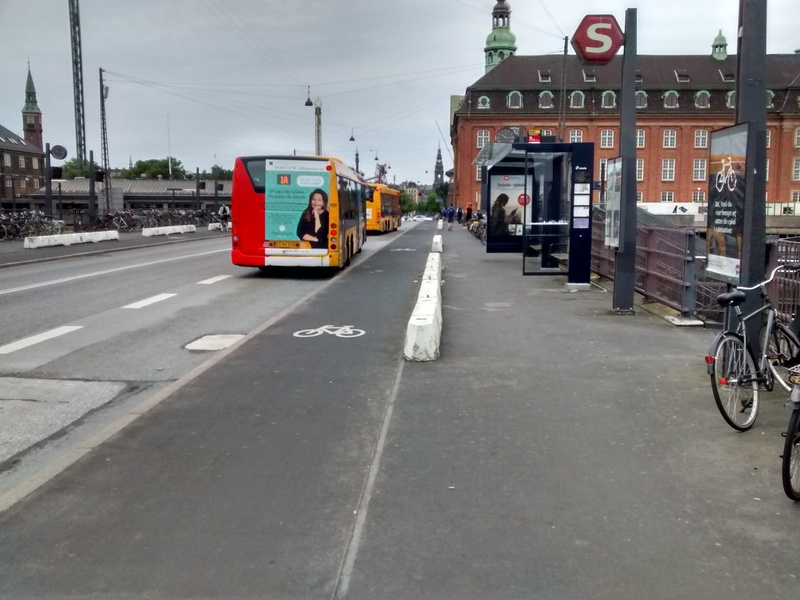 The main purpose of this post is just to provide some images of Copenhagen bus stops for those who are already well informed. You might like to jump the explanation and go straight to the images. 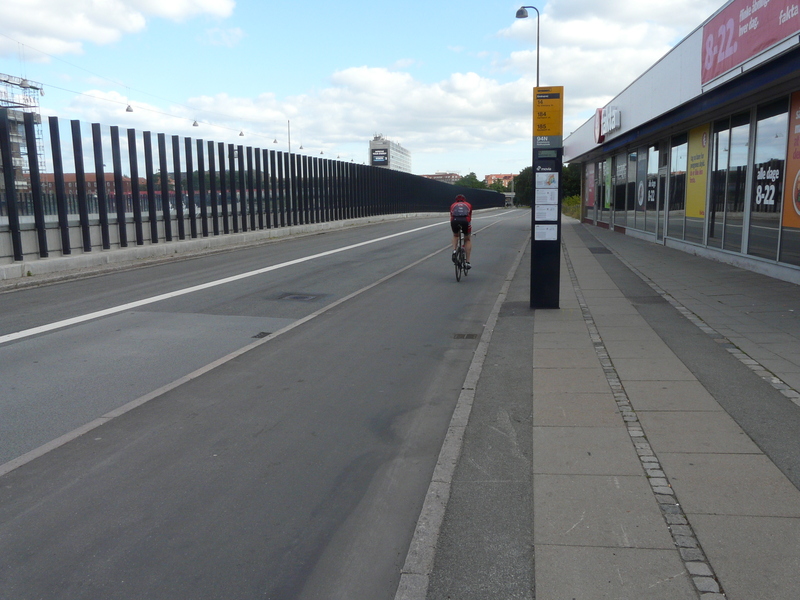 This might seem odd to some, but on a recent family trip to Copenhagen I found myself taking photos of the way that bus stops co-exist with roadside cycle tracks. I’m not going to discuss floating bus stops and UK infrastructure in detail because others have already done a good job of this. I’ll really just show the Copenhagen images. Briefly – for those that haven’t ever considered bus sto p design in detail – here’s the problem illustrated in a simple image. The details don’t matter here – what the image illustrates is very simple. There is a need to get bus passengers on and off buses. 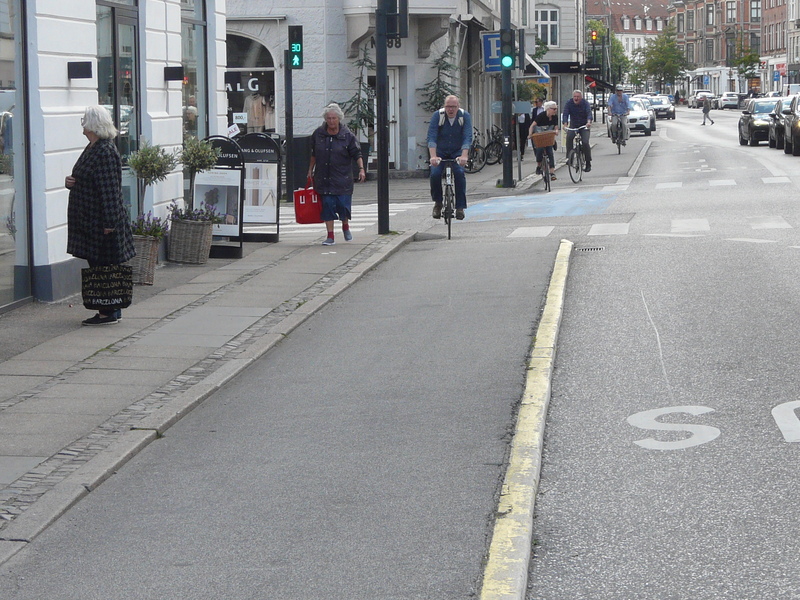 Where cycling space is between walking space and driving space, people and/or vehicles have to cross paths. Obviously the situation in this particular diagram presents the most dangerous of the available options. 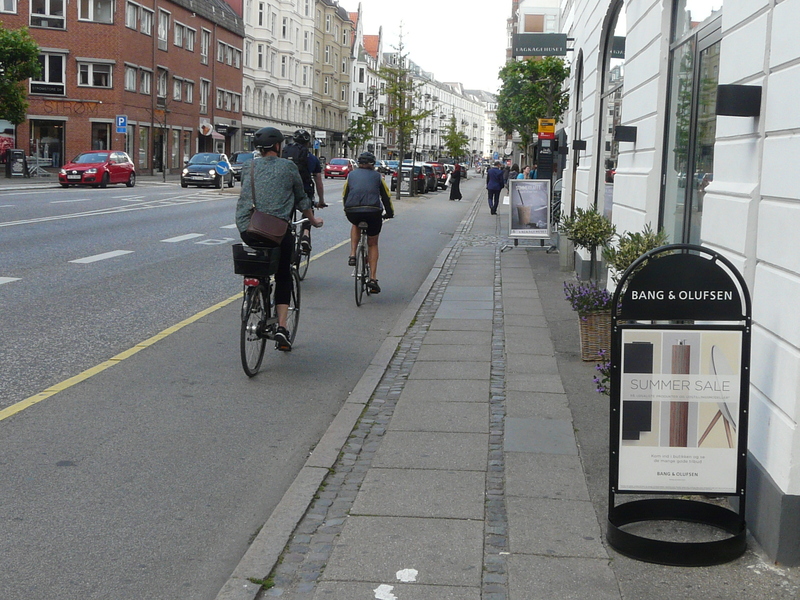 Take note that the diagrams I’ve created here show people walking and cycling on the right of the road in order to match the photos of Copenhagen. 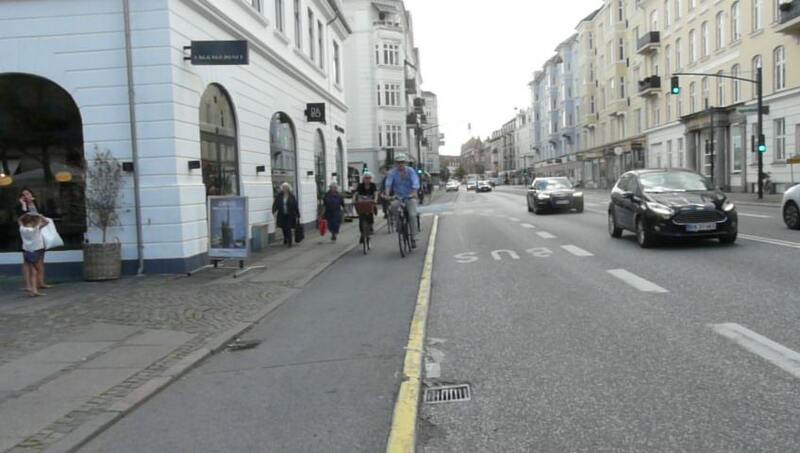 Which leads me to point out that I didn’t see any situations like the one in this diagram in Copenhagen. This is more representative of what’s seen in the UK (although I didn’t draw the drain covers, faded paint, gaps, narrow bits, etc). It is interesting to note that there is one specific rule/convention at work in Copenhagen that I’d not knowingly come across elsewhere. 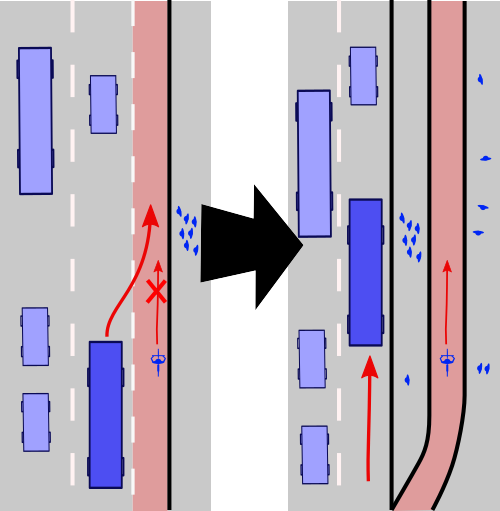 As indicated in this article [external link] the expectation is that where the bus picks up or offloads people immediately onto a cycle lane those on bikes are obligated to give way. Some of the images below illustrate this arrangement. There are no special measures in place here. People on foot simply walk across the cycle track when it’s clear. It’s incredibly simple. Note the low kerb edge. In comparison to the UK this will be a significant aid to access (or crossing the space) using a wheelchair or with any other wheeled device (pushchair, pushed bicycle, shopping trolley, walking aid, etc). 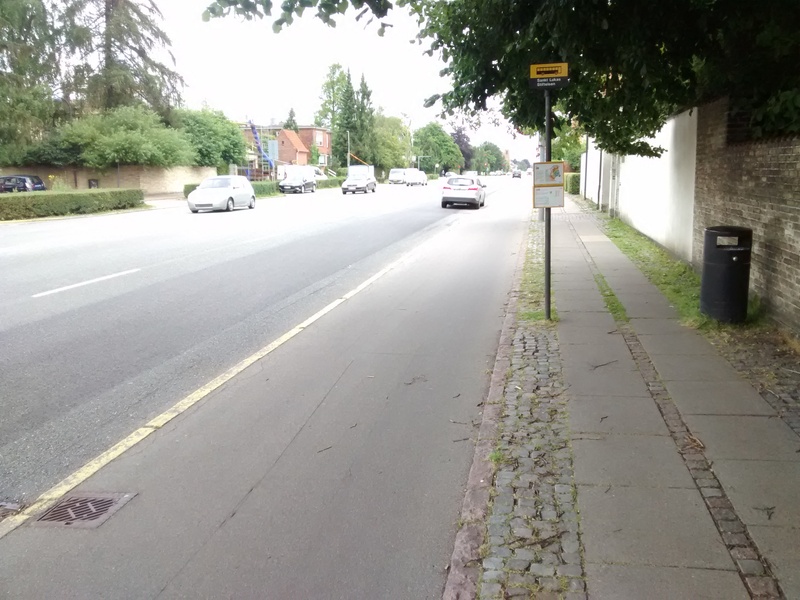 There is also a very obvious distinction between spaces for walking and cycling – the cobbled stone may not be tactile paving, but it certainly delineates the space well. 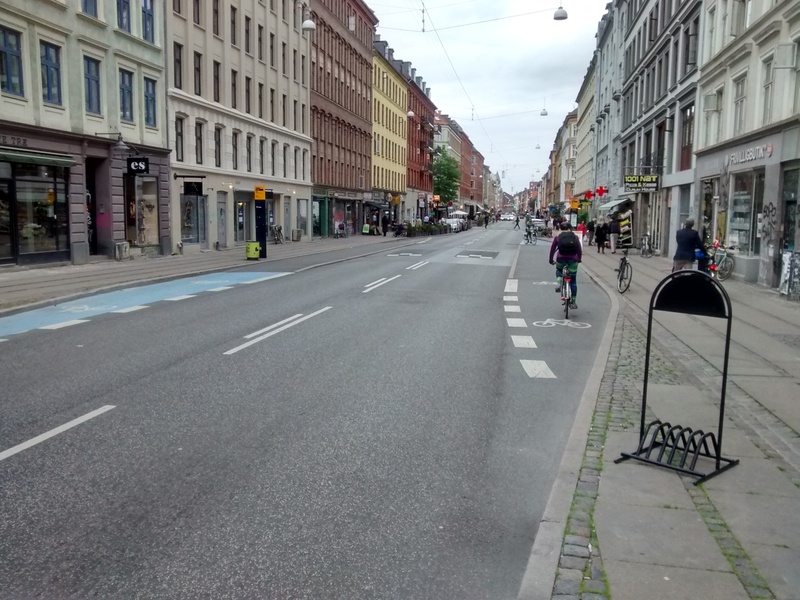 Note also, that this hasn’t been achieved by sticking a cycle track on pavement space, but by sticking a bus stop and cycle track on what would previously have been wide roadway. Here’s a Google Streetview image of the stop above, although it’s not particularly helpful due to the viewing angle. This is another example of just the same thing. The cycle route that this is part of [map link] carries people at speed, travelling longer distances alongside a fast road (and motorway). 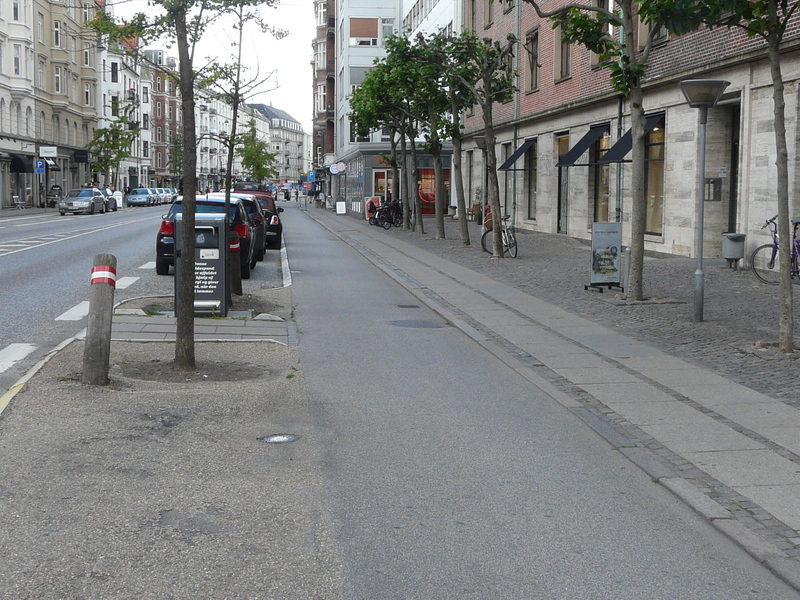 People who appear to be cycling fast can be seen on Google Streetview, which also reveals recent changes – indicating that Copenhagen is still moving forward. Where the bus previously pulled off the road, now there is no need. What was previously a bus lay-by has become the floating bus stop island. The bus now just stops on the road. 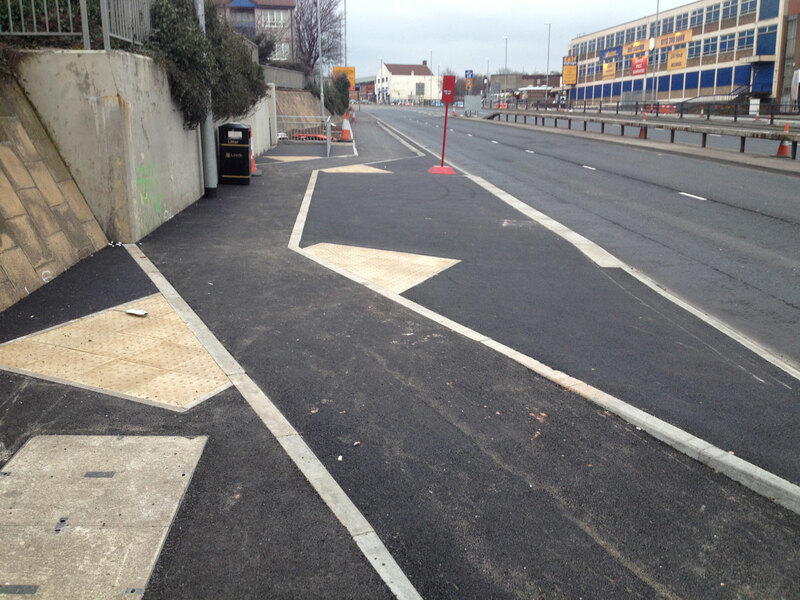 An interesting feature here is the simple tarmac ramps. 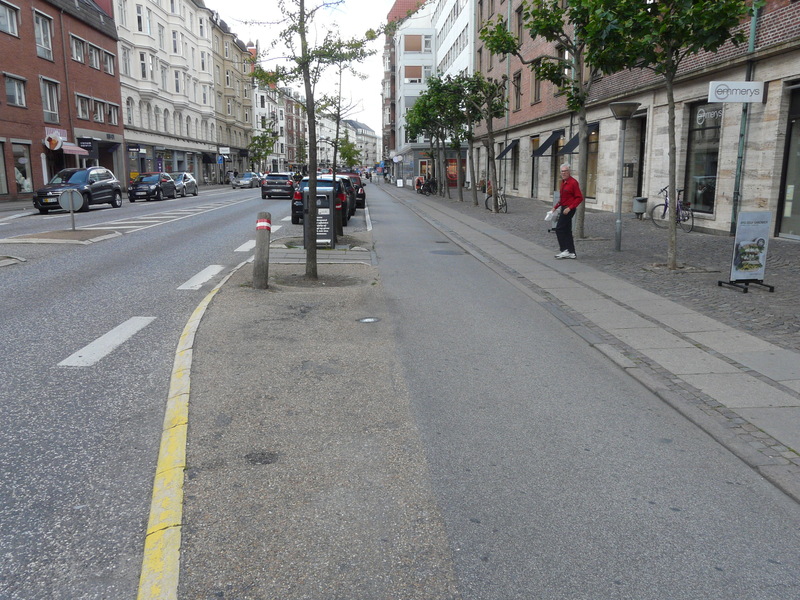 These are extremely common in Copenhagen, providing an immediate, cheap, and adaptable way to support access across deeper kerb edges. They may not be pretty… but they work. Note the absence (as above) of any special markings on the cycle track to support people to cross. This doesn’t actually worry me particularly. We live in cities and towns where most people cross most roads without making use of special crossing points. Without signals, or zebra crossings. Only the big and busy roads have these special crossing points. Unless you’re funnelling all of a town’s bicycle users onto one track, making it extremely congested, then crossing should be simple. In fact it will be far safer and easier to cross than at the majority of non-signalised UK junctions. 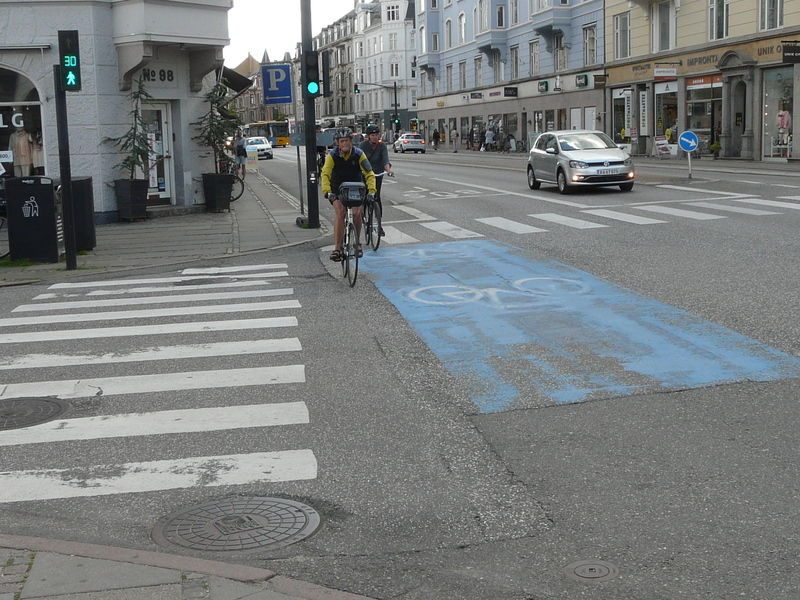 To be clear – I AM worried about the ability of some people to cross cycle tracks, but I’m LESS worried about them crossing these than I am about those same people crossing most of the ordinary roads of a normal UK town or city (which also carry bicycles of course). I should also be clear that I’m not necessarily saying that the addition of crossing markings is a bad idea as such. Yet another ordinary bus stop. This has a small kerb edge (and shallow tarmac ramps) on the right, but it has a level surface delineated with cobbles on the left. Here it is on Google Streetview. The bus shelter isn’t part of the ‘island’ but is on the main footway (actually a wide public square area). I think I’m less impressed with this. It would be nice if the track stood out a little more. But the low kerbs must be helpful for access in other ways. This stop is on a road heading out of the city, which is wide and straight. Here it is on Google Streetview. Interestingly despite the huge amount of space available there is only one running lane in each direction for the motorised traffic. There is a lay-by arrangement for the bus to stop. You’ll also notice that again the actual shelter isn’t part of the ‘island’ but is on the main footway. 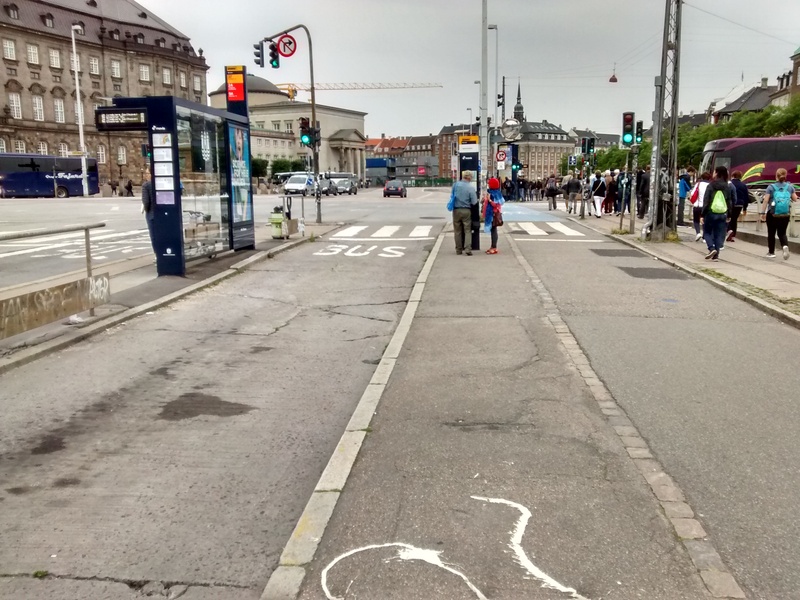 As if to prove that floating bus stops are a simple and safe thing to implement, here in the middle of Copenhagen is a much more complicated arrangement. 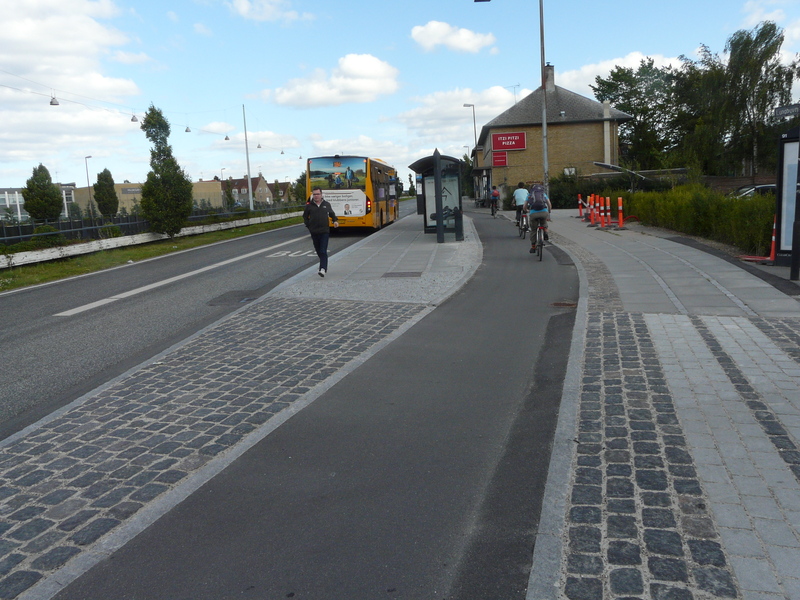 The very wide road at this point has two bus lanes/stops (going in the same direction, in the image to the left of centre, and further left again), and a cycle track (right side of this image) and ordinary traffic to the left of all these features. On Google Streetview it is possible to see that the zebra crossings are here to support people to cross the whole road (they don’t appear to be here specifically because of the bus stops). This isn’t Utrecht or Amsterdam. 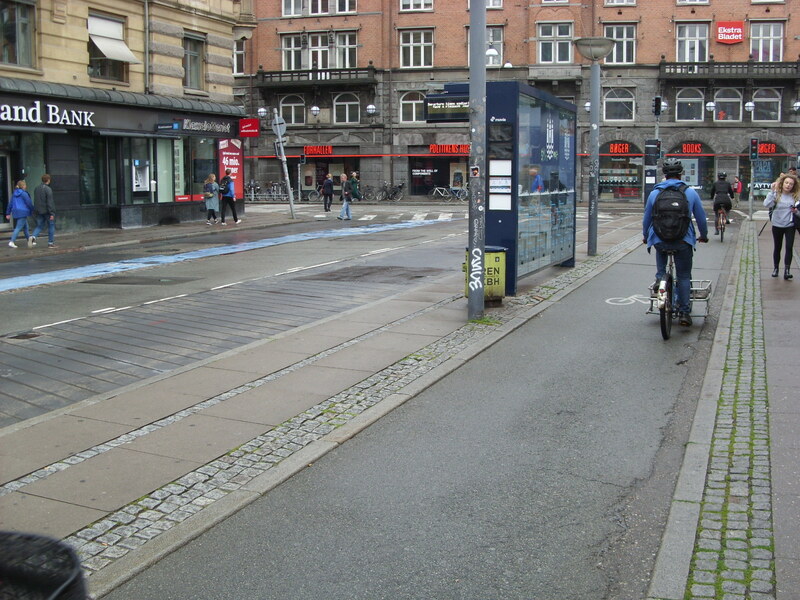 The streets of Copenhagen are still dominated by motor vehicles, and wide crossings like this are common. 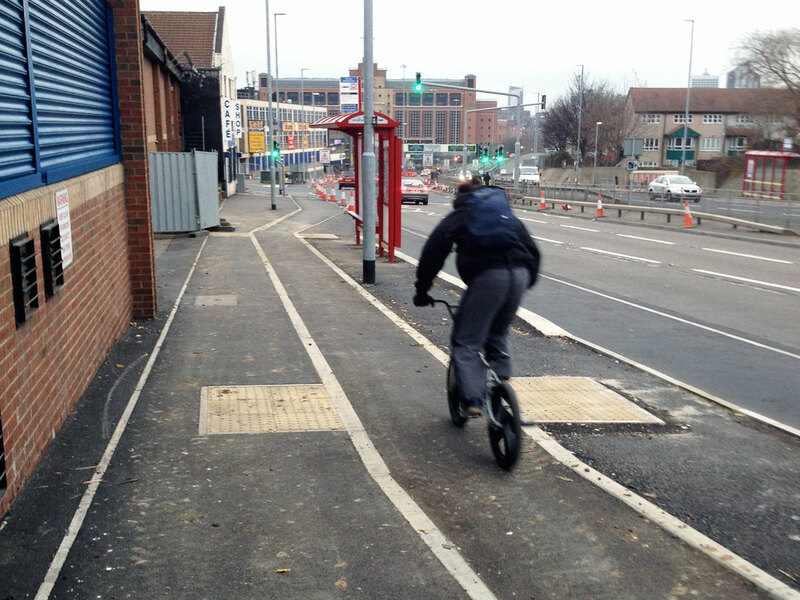 Now we’re on to images where bus passengers actually alight/board directly onto/from the cycle track. As far as I could see this worked just fine. Clearly it’s not seen as a good arrangement, but one that is employed when there’s less willingness to take space away from the road. I’m sure it’s irritating when you’re cycling and in a hurry, but the compensation is that so many roads have direct and wide cycle tracks. This location is close to the central station. 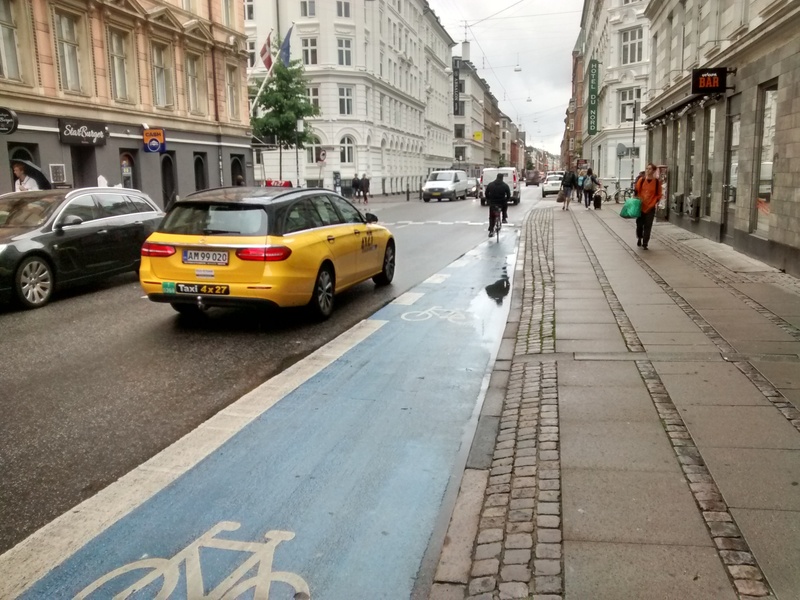 As with much of the infrastructure in Copenhagen there is a feeling that it has been introduced fairly rapidly, with issues tackled as they went along. I’m assuming here that the barriers have been introduced to discourage people standing on the otherwise less obvious cycle track while they wait for the bus. Google Streetview confirms that they were added relatively recently. This is another situation where bus passengers load/unload directly from/onto the cycle track. 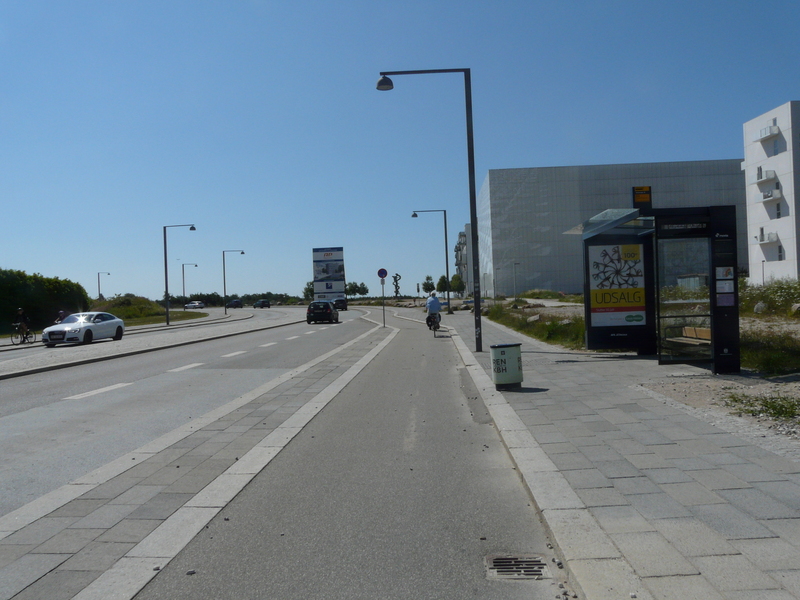 Google Streetview shows that this is yet another situation in Copenhagen where (since 2014) a cycle track has taken space from the road (NOT from the footway). Discussion over the detail of the bus stop has to take this into account. While it’s not ideal that those cycling need to wait if people are getting on or off a bus, most of us would accept this if it was the price for such long stretches of properly segregated cycleway as exist here. While using a long stretch of track here we did not need to wait at all at any bus stop. Such arrangements perhaps work best further out of town, where buses are relatively uncommon. Another example of buses loading/unloading directly from/onto the cycle track. Here it is on Google Streetview. This was further from the city centre. This example is much more interesting. A look at the area on Google Streetview makes it clear that this is in the middle of a major shopping street – with high end shops. 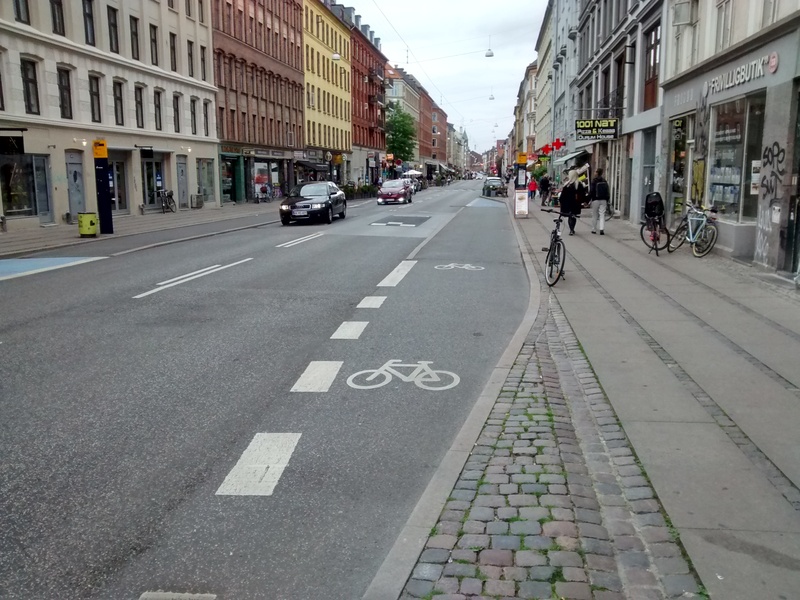 While I’m saying that to me this is interesting, what it emphasises quite how unremarkable such arrangements are in Copenhagen. 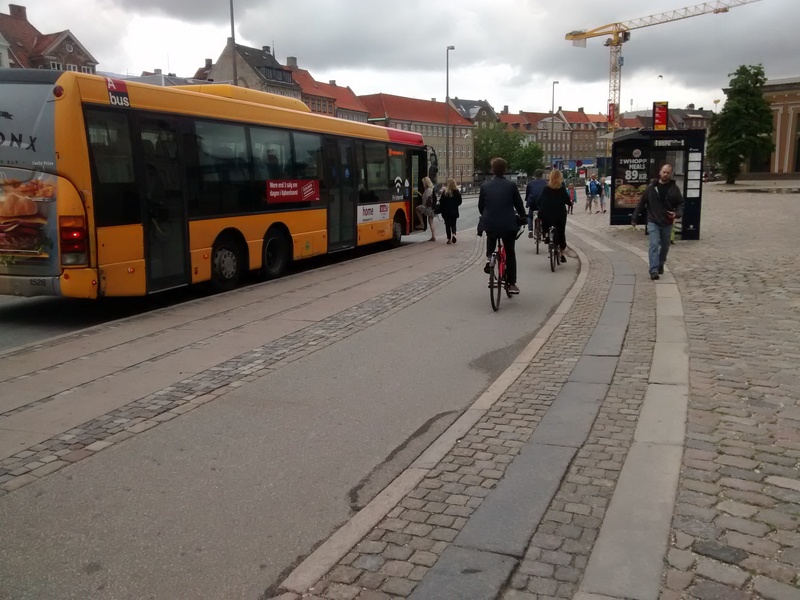 From the perspective of people actually living in Copenhagen, mixing cycle traffic and bus passengers seems like a quite sensible thing to do. The whole thing seems about as uncontroversial and unremarkable over there as any old ordinary bus stop is over here. Take a look at some further images of this area and people cycling through it. Really, what’s the big deal about bus stop bypasses? Treat people on bicycles properly – not just tolerate them, but really genuinely treat them properly – and give them space to relax, and generally speaking they treat people not-on-bicycles properly in return. I’m not saying this is a bargain to be struck. It’s not ‘give and take’. It’s not ‘sharing the road’. It’s just ordinary simple human behaviour. Finally, this is a really interesting example of a bus stop, although I’m not sure that I like it at all. First some context. This is on a road which, for me, emphasises that Copenhagen is still a long way behind some of the cities in the Netherlands. Take a look on Google Streetview. Protected infrastructure on this road comes and goes – often giving up and leaving people mixing with fairly heavy traffic. My family cycled from the far north to the far south of the city, but despite staying locally we didn’t cycle here. But we saw plenty of people trying. 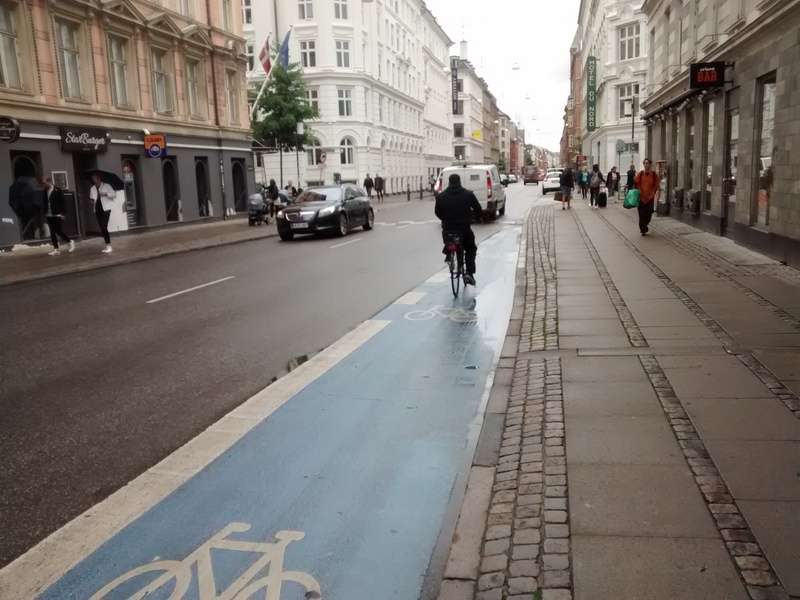 My overall feeling about Copenhagen is that it remains completely dominated by motor vehicles – even although many people cycle. This isn’t true in the Utrecht or Amsterdam or the areas surrounding them. So with that context, what we have here is a device which means that it’s possible for people to overtake a bus on the right while it is at the stop. I guess that in some ways this is better than asking them to overtake in the middle of the road. But presumably on those occasions when a bus has stopped the person cycling will be expecting to have to stop for those passengers getting on and off the bus. So how is this helpful? What I think is the major effect is what happens when no bus is present. 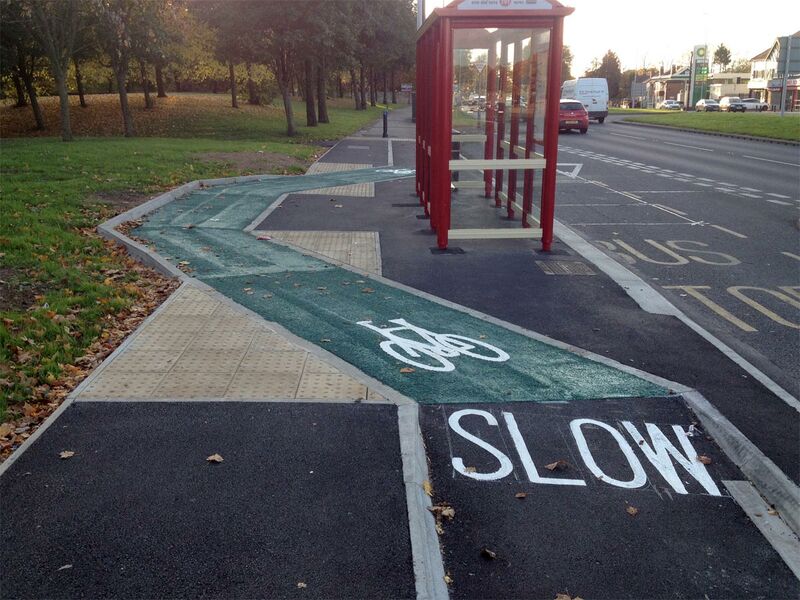 It encourages people on bikes to very temporarily leave the stream of traffic and then re-join. Presumably this sets up all the normal risks that people in the UK are familiar with. Again, how is this helpful? Perhaps the only benefit is to provide somewhere relatively safe to stop the bike while waiting for the bus to move on? 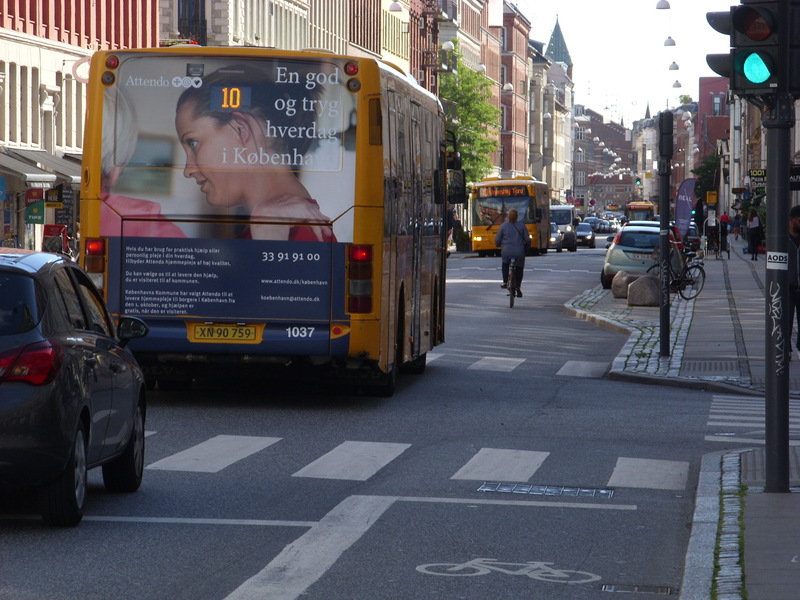 Despite these issues what this stop does emphasise, again, is that Copenhagen is completely relaxed about mixing bus passengers with people cycling. Which is my main message after all. Indeed. I agree. I am sure they exist in many countries. Currently in the UK the ‘bikelash’ means that this is one of the battlegrounds. Unreasonable fears are created. Campaigners working on the rights of those with disabilities are co-opted into the fight… used as pawns to add weight to anti-cycling rhetoric by those with little interest in the welfare of anyone but themselves. Logic and reason are left behind in favour of stereotype and scaremongering. ‘Cyclist’ versus ‘pedestrian’ stories float to the surface. Thanks for your comment Gary. I hope you’ll accept my assurance that actually I care very deeply about making the streets accessible, usable and simply decent places to be for everyone. I’ll not complain if you feel that something I say is wrong, but I’ll definitely object to any assertion that I don’t care. The first 20 years of my career were focused on social inclusion and disability (outside of transport issues). I hope that I’ve been able to bring my passion for this into my current work and interests. If you’d like to talk about details you may find that I agree with you.